Democratic political geniuses want to nominate private equity executive to run in 2020. 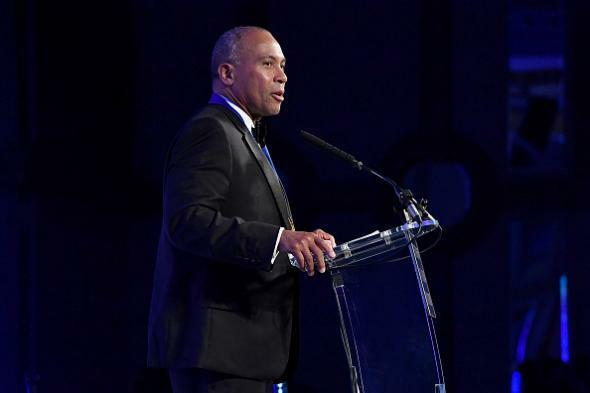 Deval Patrick in Washington on June 22. You may remember Bain Capital as the private-equity company co-founded by Mitt Romney—as in, the Mitt Romney who Barack Obama (a Democrat) effectively attacked for enriching himself through mass layoffs during a 2012 election that many “Obama insiders” should have at least a passing familiarity with. As it happens, many Obama voters—including those in, to name three states at random, Pennsylvania, Wisconsin, and Michigan—would go on to vote four years later not for the Democratic candidate whose insider connections and high-priced speeches to Goldman Sachs became a major campaign issue, but for the Republican candidate who made repeated and energetic (albeit totally dishonest) promises to stick it to the rich and powerful. Apparently Obama insiders do not have a passing familiarity with that election, but it was bad. It was a problem. One group that believes that Democrats shouldn’t overtly represent the interests of the wealthy, in fact, is the current Democratic Party. Even Senate Minority Leader Chuck Schumer, a New Yorker who counts Wall Street executives among his most prominent constituents (and top donors), is on board with a 2018 Democratic platform that frames the party’s agenda as a matter of increasing wages while diminishing corporate power. Is a finance executive who conducted his Politico interview at “Bain headquarters in Boston” really the ideal messenger for this sales pitch? The Politico article acknowledges this practical reality, sort of, writing that “Bernie Sanderized Democrats … are suspicious of finance types to begin with, and were taught by Obama’s 2012 brutal campaign attacks on Mitt Romney to think of Bain as a curse word.” (Again, though, the group that swung the 2016 election was not “Bernie-addled coastal leftist elites,” it was former Obama voters in the Midwest.) The piece then suggests that Democratic voters in 2020 might rally around the idea of “taking on Trump’s management shortcomings” and “calling for a different way of merging government and business experience.” And, well, I suppose anything can happen in three years, but if the 2020 Democratic primary turns on an angry base’s passionate demand for “a different way of merging government and business experience,” I will eat a hard copy of the Mitt Romney “47 percent” video. Politico, incidentally, published more or less this same piece—a 2020 “will he run?” trial balloon describing momentum building behind a candidate who has good relationships with party operatives and wealthy donors—in July, except that one was about Andrew Cuomo, who would also be a bad 2020 nominee. I look forward to reading “Democratic Insiders Are Buzzing About This Anthropomorphic Stack of $100 Bills” in Politico in September. 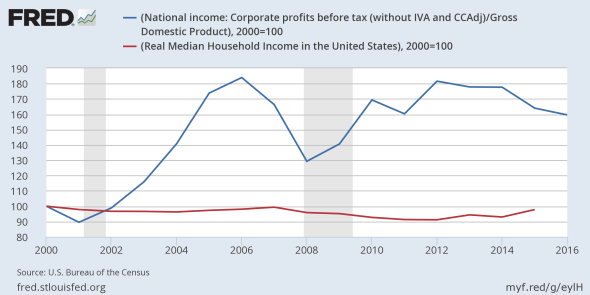 *Correction, Aug. 1, 2017, at 2:10 p.m.: This post initially included a graphical comparison of GDP growth to real income growth rather than the comparison of corporate profits to real income described in the text. Classic economics graph mix-up!